For over 40 years the Red Arrows have been thrilling crowds at air shows both across the UK and internationally. They are quite simply the best at what they do. The Red Arrows, officially the Royal Air Force Display Team, are the public face of the RAF, formally promoting recruitment, as well as providing inspiration to significant numbers of those who join the Royal Air Force. Starting out as “The Yellowjacks” in the early sixties the Reds officially took to the skies in 1965 flying the Folland Gnat before transferring to the BAE Hawk advanced trainer in 1979. The pilots are renowned for their precision, and with such professional excellence, it is little wonder that the Red Arrows never fail to enthrall with their breathtaking displays. Although demanding training routines and years of operational flying experience certainly contribute to this magnificent team’s continued position as the premier team in the world, the Red Arrows’ pole position is not just down to the pilots or their British aircraft...there is a huge support network necessary to maintain their place as the world’s top aerobatic display team. 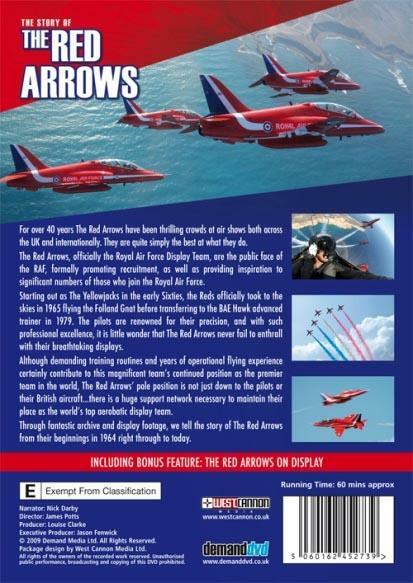 Through fantastic archive and display footage, we tell the story of the Red Arrows from their beginnings in 1964 right through to today.